Update; Saturday and Sunday were busy but it rained on Monday so that was a bit quiet! I’ve had lots of interest in the engraving – it gets interest from people who are accompanying gun nuts but are not interested in guns themselves! I’ve reverted to screwheads as it doesn’t require too much concentration, and shows up well on the screen, which is very successful. It is difficult to do anything much larger because I don’t have my proper turntable and its difficult to rotate things and keep them in the field of view. 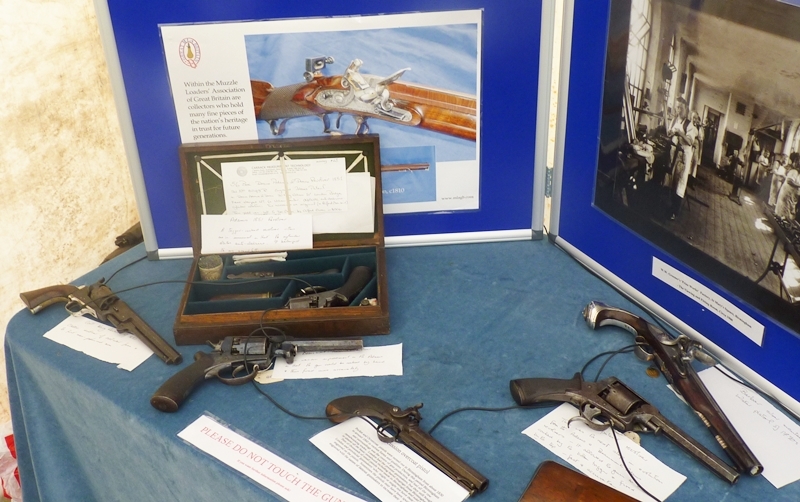 Here are some pictures of the setup – today I took a few percussion revolvers – a rather worn Colt Navy, a restored Deane, Adams and Dean 56 bore, A Beaumont Adams and a Tranter double trigger – all from the 1851 to 1870 period. I also took my much restored Lancaster Oval Bore double rifle – see separate entry in in this blog. Sunday’s display in need of a tidy up! 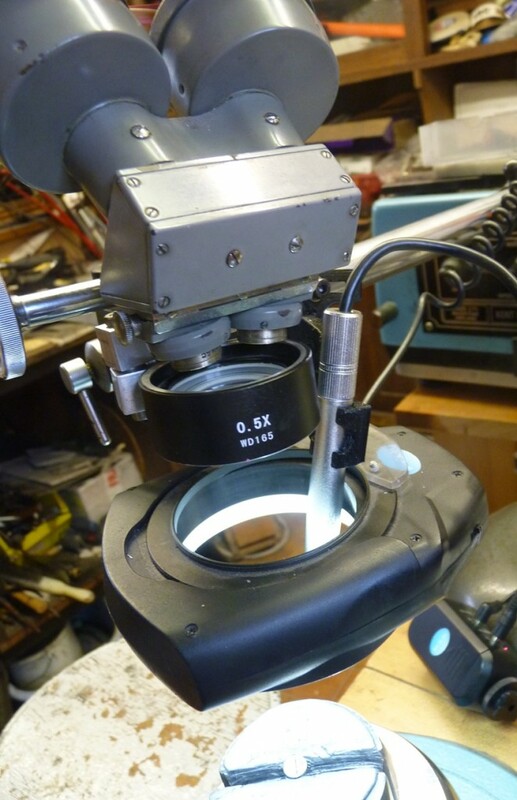 As it is difficult for people to see engraving in progress I decided to investigate microscope cameras, and found a handy ‘Supereyes’ model on Ebay that is only 11 mm in diameter at a modest cost (£11 from HongKong). Since there is no mains on our stand at Fenland I was keen to get it to run with a tablet, and found an Android app CameraFi that works with tablets and phones using a small ‘OTG’ adaptor cable on their micro USB socket. Very quickly set up on my old Asus Transformer tablet, and the Asus 7 we recently purchased for navigation in Scotland and on Gile’s phone but not on my new Moto G, not that it would be very useful on the phone, just fun. Giles has just got a 3D printer and so was keen to make a few brackets to mount the SuperEyes on my microscope, and it all works pretty well. All up and running. I just have to come up with some things to engrave! My default for demonstrations is screwheads, but I might come up with a new lockplate for a pistol I’m thinking of making for an old barrel I’ve got. Its a bit of a squeeze getting the camera between the Bartlow lens that increases the working distance and the big ring LED light, but it does all fit – just! These were the first things Giles printed, he has since tuned up the printer! 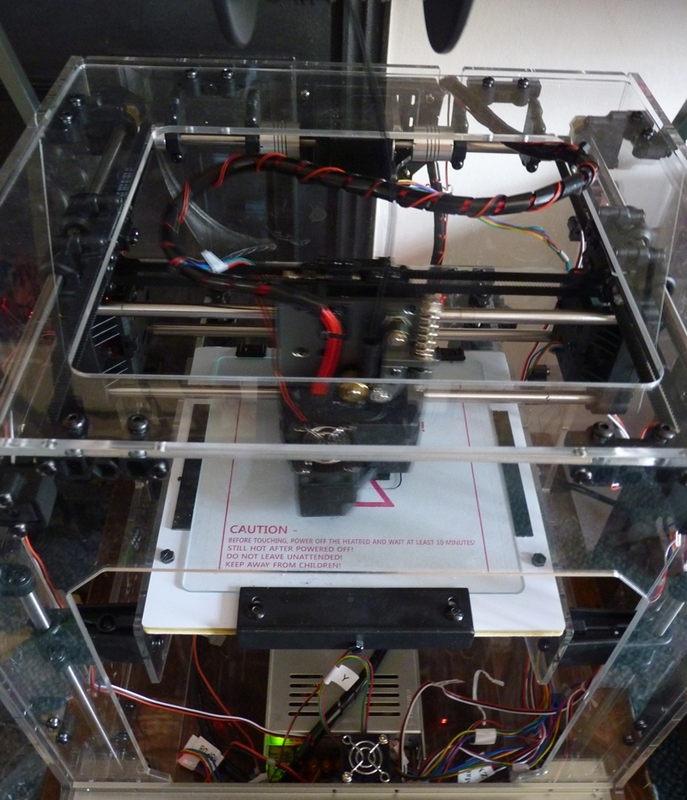 The Turnigy Fabrikator 3 D Printer – an amazing machine for the money! All amazing technology! 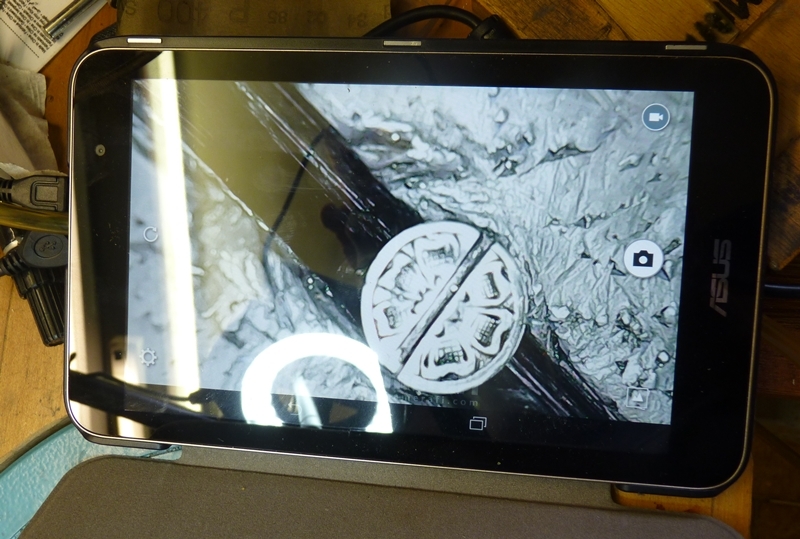 The camera is so good that I can just about engrave looking at the tablet image rather than through the microscope! 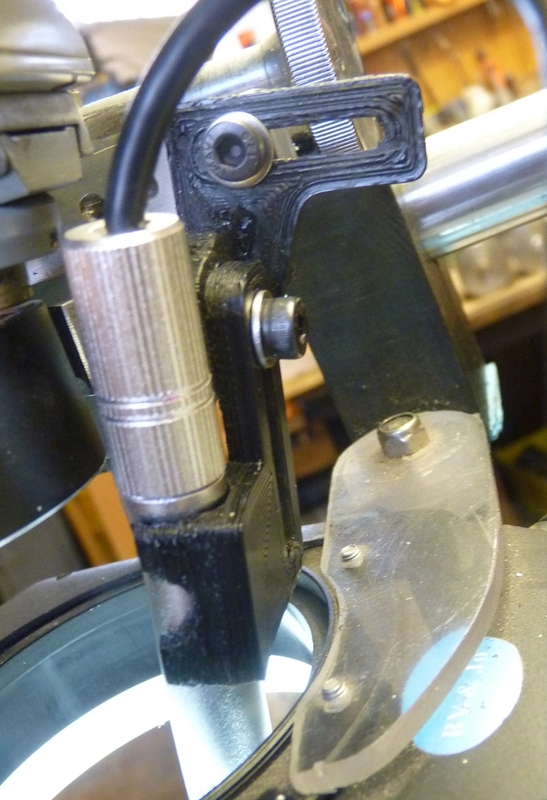 I had to get CameraFi to up the frame rate from 7 fps to 30 fps before the delay became small enough to do things that way, and a bit more magnification might also help – new mounting brackets to get the camera nearer are on the way. 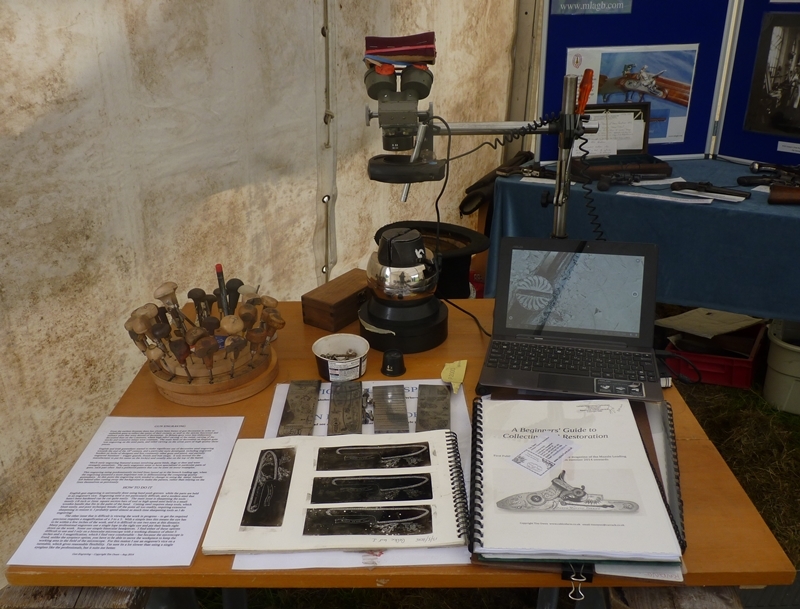 Now that just leaves the task of making blank screwheads and selecting some guns to take……..
Come along and see us at Fenland!